Do You Want to Look 10 Years Younger? •Look younger without having to buy expensive cosmetic products? •Eat great-tasting foods that erase wrinkles and sun damage? •Rehydrate dry, flaky skin simply by making small changes to your diet? 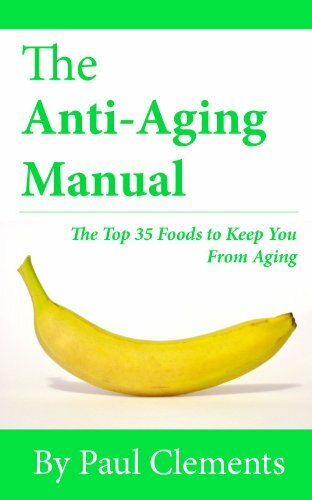 The Anti-Aging Manual by nutritionist Paul Clements is a book that will teach you which foods can help you to look younger (and why) and which foods are the ‘age accelerators’ (and should be avoided). •The Basics of Anti-Aging Simplified. •The '5 Kings of Anti-Aging' - Antioxidants, Omega-3's, Resveratrol, Selenium and Protein. •The Top 35 Anti-Aging Foods. •What to Avoid – Food & Drinks That Speed Up Aging. Scroll up and click on "Buy Now" to get this book delivered instantly to your Kindle or other reading device!